Hello, hello, hello! How are you all today? I have had a day where I felt positively useless, and unproductive, despite all my efforts to the contrary, so there was nothing for it but to crack out some potatoes and make something comforting, to soothe my addled brain, and start again. Earlier this week I re-enacted a near annual tradition. I met a bald man from Essex in a random part of town to make an illicit exchange. Something that I have that I am willing to part with, for something fragrant. He had in his hand a heavy grey plastic bag with green muddy tentacles peeking out. His name is Danny (Food Urchin), and he has brought me some wild garlic. Hurrah! The tradition is thus. Danny has a garden full of wild garlic, and when I am in town in the season, I meet him and get a plant. In exchange he gets something random. In fact, that is how I first met Danny. I wandered to Borough Market to meet a strange man with a wild garlic plant, and it was him. Not so strange at all, and now a friend, if a wild garlic yielding one. This year, I gave him some of my Japanese SPF130 (yes! ), for he is ginger, and is as a-feared of the sun as I am with my pale Irish skin. Wild garlic is glorious. Ample and clumsy and generous, it has a fragrant sourness, and is pungent with garlic aroma. It loves cream and all things dairy, which really suits my mood today. While I sat freaking out about my to do list, it was peering out at me from its grey sarcophagus, tentacles waving (ok, maybe not) on my kitchen floor. I must plant it (with the hope of having lots more in my garden next year, it likes to take over), but before then, I want to use some. Today, I needed something decadent but also perky, so as I stare at my wild garlic plant, hoping that it will reveal the secrets of the universe I think – got it! 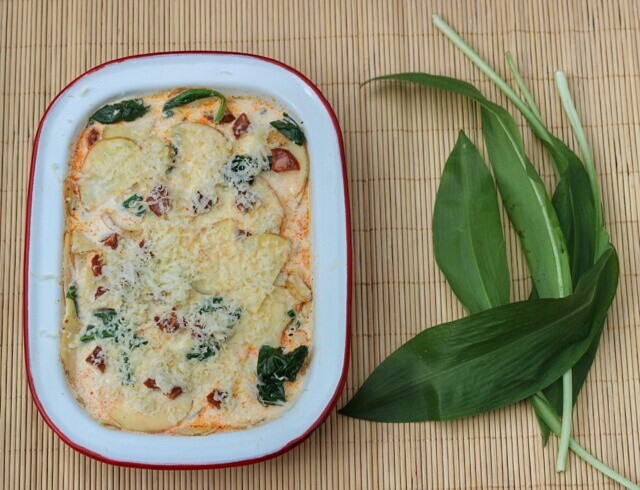 – wild garlic and chorizo potato gratin. Done. This is so easy. Gather as much wild garlic as you can, but if you can’t get any, use a couple of garlic cloves. I would slice the garlic into very fine slices (if you like it pungent like I do), before very lightly frying them until approaching golden but not brown and accrid. Then add to your cream. There are still some spaces available for my Sunday Bacon Club at the Underground Cookery School on Sunday – details and how to book here. I haven’t scheduled anymore in London for the foreseeable. So, if you are keen, best book it now as I don’t know when the next one will be. Sauté the chorizo in a dry frying pan (it has plenty of fat inside it) for a few minutes until it is starting to crisp. Remove from the heat and leave to the side. Heat the cream (bring it to just before the boil, but don’t boil it) with the wild garlic and bay leaves in it (if using the bay leaves). Leave to sit for half an hour to let the flavours infuse. Remove and discard the bay leaves and season with a little sea salt before adding the potatoes and chorizo and thoroughly mixing. Grease your roasting dish and add the potato and cream mixture. ensuring that the wild garlic and chorizo are evenly spread. Press down to ensure that the potatoes are tight, and finish with grated cheddar. Roast for 45 minutes or until the potatoes are tender (a sharp knife should pass through them with no resistance) and the top is golden. Eat! Lovely with salad, or roast chicken or whatever you like. What a lovely story and a wonderful potato gratin recipe. Sounds absolutely delicious. We have loads of wild onion (three-cornered leeks?) in our garden at the moment. Do you think I could substitute that? 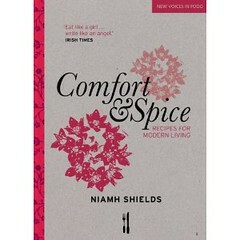 It sounds lovely and I really wish I knew someone to bring me some wild garlic! Hello, Niamh! I’ve never seen wild garlic before so I had no idea it was leafy like this. I was given a homegrown normal garlic clove a while ago and I couldn’t believe how much fresher and tastier it was than the supermarket stuff. I love chorizo in things like this, so I’m sure this dish would be right up my street! mm, that sounds so comforting and delicious! This looks AMAZING! Love chorizo, love garlic, love cheese…..I need this in my life! Wild garlic is growing in abundance in the field next to my house, what a perfect use for it! I love wild garlic season. That gratin looks fit. I will definitely try this one – I am a great fan of all things choirzo and garlic. 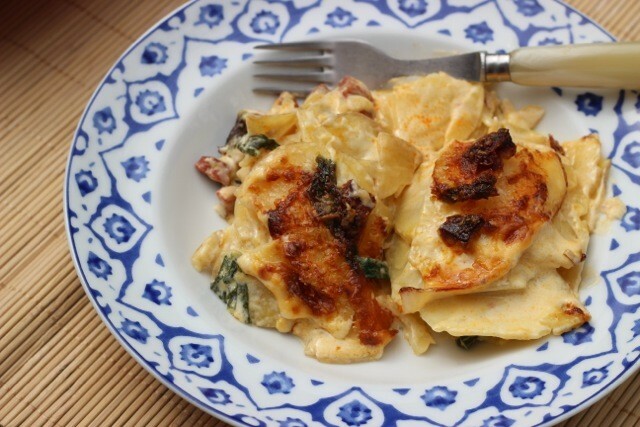 The two together in a potato gratin sounds absolutely divine! I do a hash-style dish with potato, wild garlic and chorizo, which I love. It sounds like the addition of cream is a great idea too. I will be giving this a try. Wow. Looks absolutely, get-in-my-face, amazing. I’ll be making this for sure. I’ve just googled ‘wild garlic’ and your recipe is the most appealing of the lot. Ended up with some in my veg box this week and wasn’t sure what to do with it. My flat mate doesn’t like chorizo though (I do question our friendship). Any good substitutes? Or shall I make a huge portion just for me. good god, that looks good! Well Hello! Accidentally Wading Into Debate, Sydney, The Greening, Mudgee. And As You Were. Or As I Was.